I never thought I'd say this but Archie #7 invoked a little of The Sopranos in it. Who knew Pop of all people had a little gangster in him. Oh, it's nothing violent or illegal this is still an Archie Comic but Pop makes Reggie an offer he can't refuse. Still reeling from being ratted out by Reggie to Hiram Lodge, Archie's trying to get back in Veronica's dad's good graces in order to keep dating her. 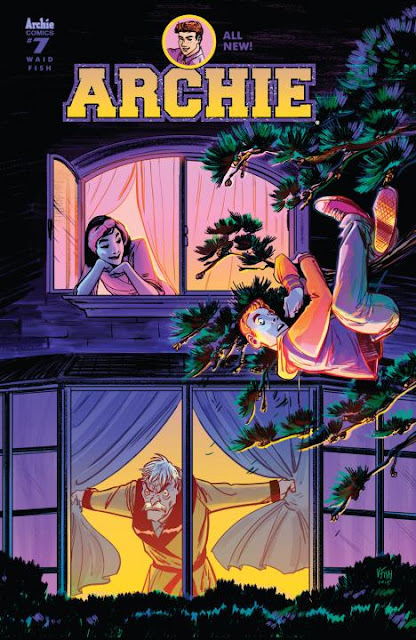 With Reggie well entrenched in the Lodge family circle, Archie mends fences with Jughead to get some help trying to pry Reggie out of the way. If that weren't enough drama for Archie, he's been seeing Betty holding hands with a mysterious suitor. A lot takes place in this issue with some of it being important. It tries and succeeds at solving one tricky issue but perhaps it was too efficiently done. The build-up and resolution seemed rush and too conveniently resolved. Reggie's dad's appearance was solely used to move the plot along. The elder Mantle was just as arrogant as his son and rude enough to be the impetus for Pop's involvement but came off as too one-dimensional. Nonetheless, you can't help but admire the stealth swagger of Pop using his knowledge to set Reggie straight. A Don couldn't have been more effective. Veronica Fish is a unique talent, using her cartoony angular drawings to bring Archie and company to life. Backgrounds are sparse at times but she excels with body language and expressions. 'Archie' is a series filled with emotions especially with a love triangle, a jealous rival, a pair of braggadocious and angry fathers are involved. Fish nails all the details while Jen Vaughn and Andre Szymanowicz provide bright and bold colored pages. Despite some convenient plot devices, 'Archie' #7 is still a fun read. It falls short of the best of the series but Mark Waid and Fish set up new storylines and mysteries yet to be revealed. Anytime, you can add a new wrinkle to a supporting character like Pop and make him look like a benevolent mob enforcer then you've done something right.